About the Book: One day. Fourteen hours. Twelve thousand Union cavalrymen against 9,000 of their Confederate counterparts-with 3,000 Union infantry thrown in for good measure. Amidst the thunder of hooves and the clashing of sabers, they slugged it out across the hills and dales of Culpeper County, Virginia. Fleetwood Hill at Brandy Station was the site of four major cavalry battles during the course of the Civil War, but none was more important than the one fought on June 9, 1863. That clash turned out to be the opening engagement of the Gettysburg campaign-and the one-day delay it engendered may very well have impacted the outcome of the entire campaign. The tale includes a veritable who’s-who of cavalry all-stars in the East: Jeb Stuart, Wade Hampton, John Buford and George Armstrong Custer. Robert E. Lee, the great Confederate commander, saw his son, William H.F. Lee, being carried off the battlefield, severely wounded. Both sides suffered heavy losses. 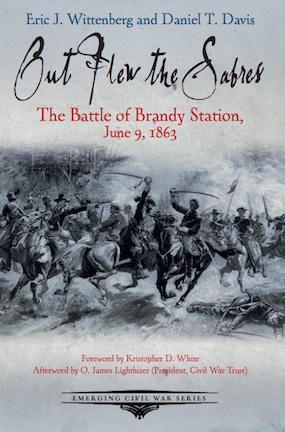 In Out Flew the Sabres: The Battle of Brandy Station, June 9, 1863, Civil War historians Eric J. Wittenberg and Daniel T. Davis have written the latest entry in Savas Beatie’s critically acclaimed Emerging Civil War Series. Civil War Monitor identified Out Flew the Sabres as one of the top ten highest selling Civil War books of 2016. About the Authors: Eric J. Wittenberg is an accomplished American Civil War cavalry historian and author. An attorney in Ohio, Wittenberg has authored more than two dozen articles in popular magazines an a dozen books. His most recent book, The Devil’s to Pay: John Buford at Gettysburg, won the Gettysburg Civil War Roundtable’s 2015 Book Award. Daniel T. Davis has worked as a historian at Appomattox Court House National Historic Site and the Fredericksburg and Spotsylvania National Military Park. He is the co-author of several books in the Emerging Civil War Series. He resides in Fredericksburg, Virginia.